I like sharing experiences about special food – dishes that make me excited and proud about cooking; restaurants that serve life-changing meals. So being one of the most common pantry items, I hardly thought that a loaf of bread would ever be worth writing back home about. Until this week. 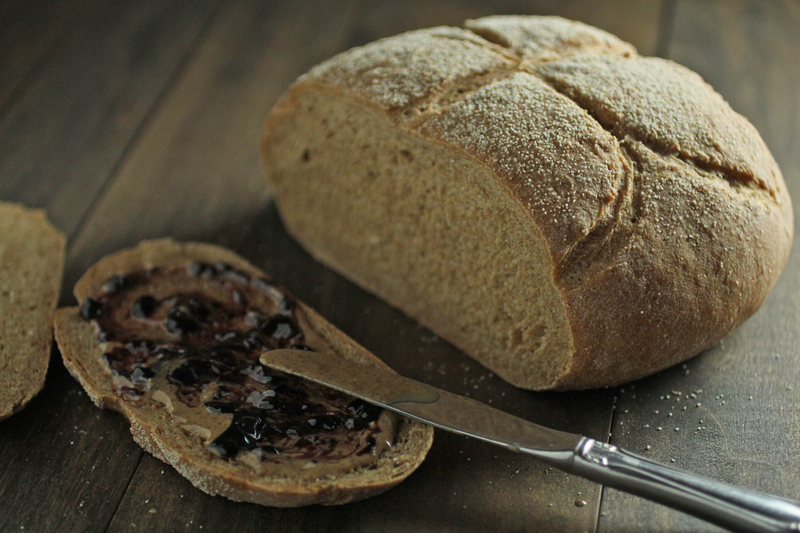 Being conscious of nutrition and a quasi food-hipster, I prefer whole wheat over white bread. 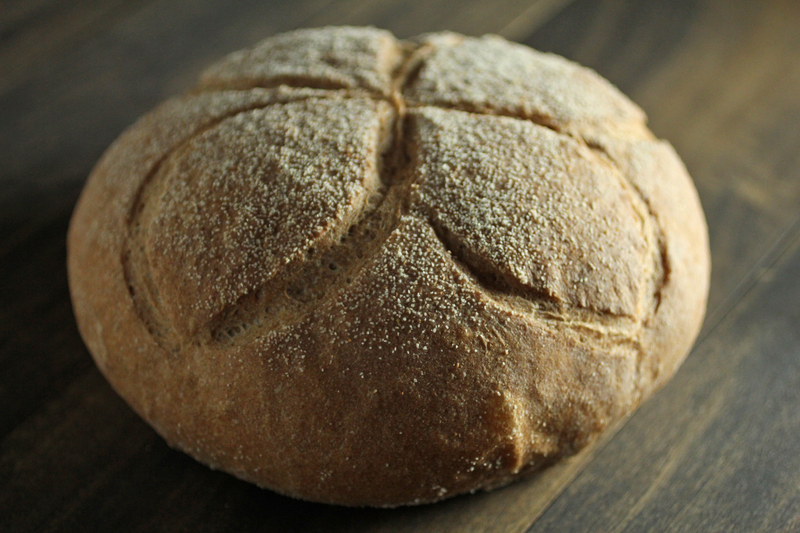 I think it tastes better and I think it’s better for you, but when I bake bread at home, I usually bake a plain white or mixed loaf because my past experiences with full whole wheat were woeful and yielded flat and unappealing loaves. 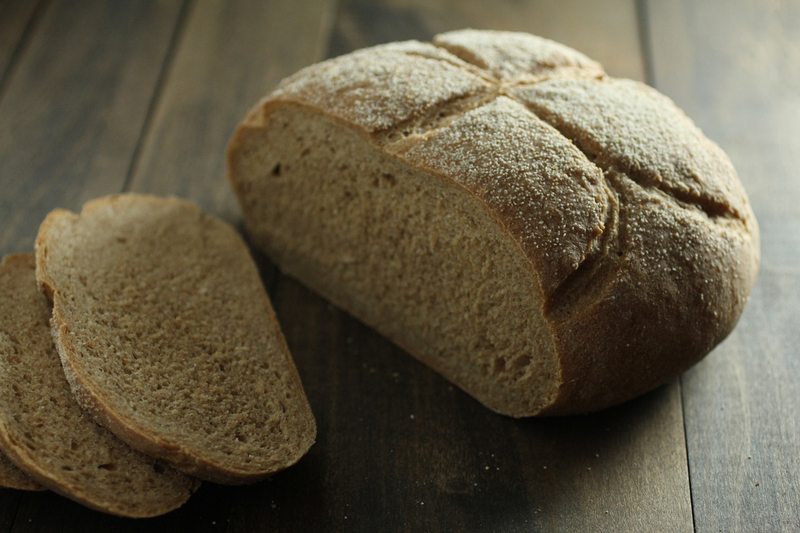 My white loaves have gotten me by for a while – good enough for some PB&Js or my much-adored Vegemite toast, but this week when I was craving the carbs, I thought I’d give whole wheat another chance. I remembered that I had some guar gum left over from a failed ice cream experiment and some gluten that I usually make seitan with. After the first hour of proofing, I was really surprised to see the dough had doubled in volume, which I have never seen with whole wheat before. Baking yielded a well-risen round with a crisp crust and warm wheat colour, and the crumb was delightfully soft and fluffy. I took it for a test run with some almond butter and blackberry jam, and I think it is the best thing since sliced (white) bread. In a large mixing bowl, combine the flour, gluten, guar gum and salt. In a small bowl, combine the water, yeast and sugar. Set aside for 10 minutes. After the it starts to form little bubbles, add the yeast mixture and oil to the dry ingredients. Mix the dough for 10 minutes by hand or with an electric mixer with a dough hook attachment. The dough should be quite wet and sticky. Remove the dough from the bowl and on a clean work surface, dusted with a little flour, bring the dough together and shape into a ball. Oil the bottom of the bowl and place the dough back into the bowl. Brush the dough with some oil, cover the bowl with a damp cloth and set aside in a warm place for an hour to allow the dough to proof. After an hour, punch down the dough and remove the dough from the bowl. Dust a clean work surface with a little flour and shape the dough into a neat loaf. Line a baking tray with baking paper or non-stick baking sheet and dust with semolina. Place loaf on the baking tray and set aside for 30 mins to proof. 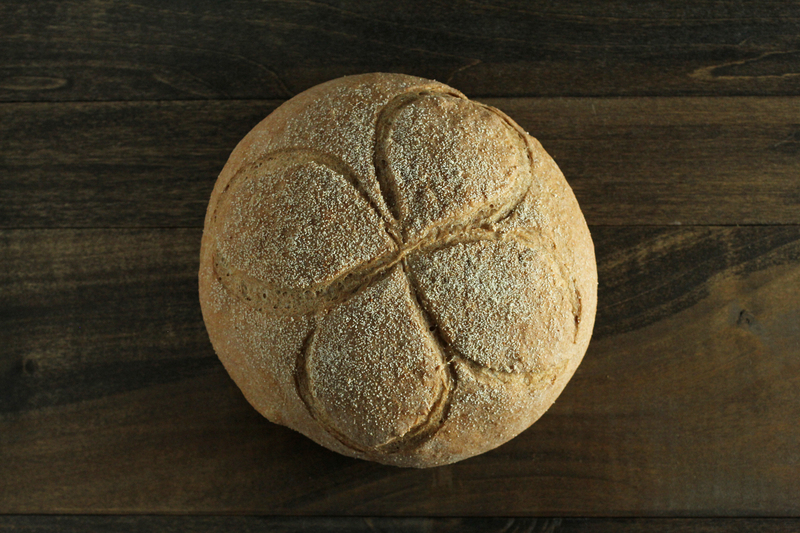 Score the surface of the loaf with a sharp knife to prevent the loaf from splitting. You can be creative here if you like! I cut a clover pattern in mine. Bake for 30 min and then remove the loaf from the oven to a cooling rack. Store bread in a cool, dry container for up to a week or alternately wrap in baking paper and foil and freeze in a ziplock bag for later noms. Nice! I look forward to seeing some photos of your baked bread Tuan! I think you can also try baking with xanthan gum too, but I haven’t tried that yet, so I don’t know how different it would be.